18 Jul 2017 - 737-300SF, PK-YGG (23743 / 1510), FF Feb 1988, operated by Tri-M.G. landed on runway 15 in fair weather at Wamena, Indonesia (WAVV) at 12:10L (03:10GMT). Initial reports suggest that the aircraft landed heavily causing the left main gear to collapse and fracturing the left wing. The aircraft veered off the left side of the runway coming to rest within the airfield boundary. There were no passengers aboard and all crew evacuated the aircraft with no reported injuries. The airport elevation is 5095ft and has no instrument approaches. Runway 15 is 1826 x 30m with no lights. 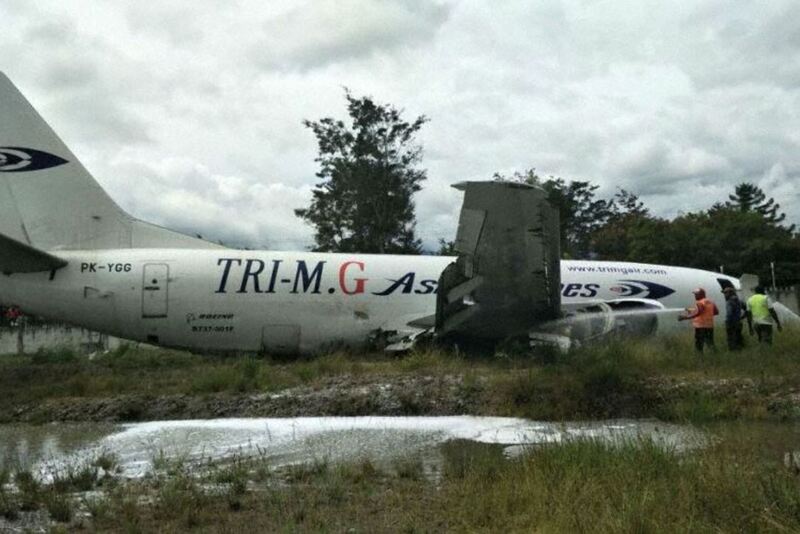 Note that a similar incident occured following a heavy landing by Trigana Air Service 737-300SF, PK-YSY, at Wamena on 12 Sep 2016. Click here for details. Trigana Air has had 22 serious safety incidents since 1992, resulting in the loss of ten aircraft and major damage to 11 others.